GABRIELLE DOHERTY BULLOCK F.G.A., D.G.A. Furniture, Silver, Diamond and Gem set Jewellery, Worcester porcelain, English, Continental & Oriental china, Art glass, Brass & Copper, Clocks & Barometers, Bronze & Marble sculpture, Toys, Eccentricities and items from the Cottages and Castles of yesteryear. 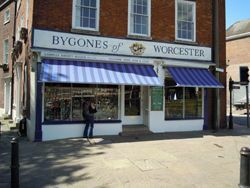 Our family business has been established in the "Faithful City" of Worcester for 100 years. We are proud of our tradition of supplying items of the finest quality and in the best, original condition. We have a wide range of pieces suitable as furnishings for your home or gifts for discerning friends as well as specialist items for collectors.